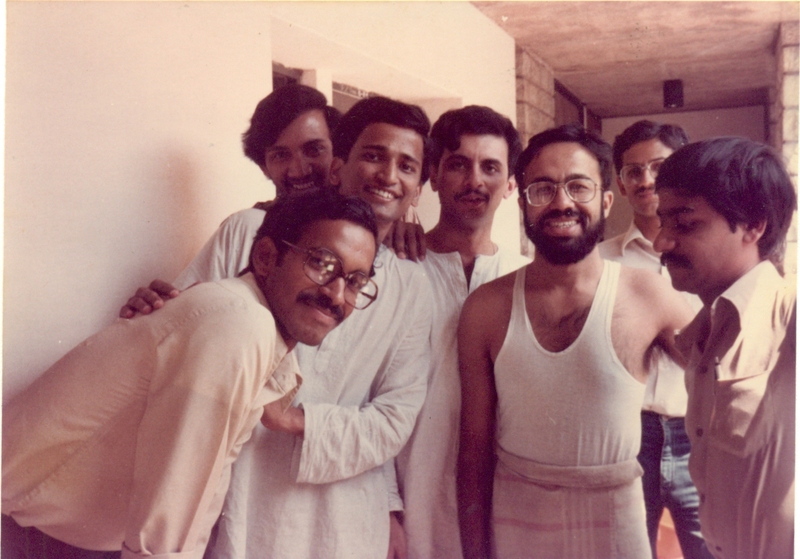 Some informal pics were also a part of our days at Bannerghatta, and the camaraderie was great! Hassled, Shanks, Vish, Ramu Jesu, Deepak/Todo and Sujit are seen in this one. And below, the last instalment of intros to my batch of MBA. He holds the dubious distinction of knocking the axe on his own foot (Apne Pairon Pe Kulhadi in Hindi)- extending the Indian Eco. end-term to two hours from the previous one-hour and then cribbing about it. Attained fame as the Baniya who sold banyans (remember the red and yellow ones - dirty, dirty... the blue ones he kept for himself). "The only one to have extracted a treat from Gopal Pai" - Old Bhau Saying. He convinced us that we were all very religious folks. It's just a question of how broad a definition you give to religion. If you start with the premise that all people are religious, the rest of the logic can be worked out very simply. His Tamil was painful - to non-Tamil ears. However, beneath the Tamil exterior, he hid hazaar hospitality, warmth, hard work and a general inclination to excel. His gesticulations reminded one of a puppet with strings detached. An enthusiastic placement rep., he discharged his duties (?) with rare aplomb.